Adhering strictly to the principles of Synthetic Phonics, these 100% decodable word and picture cards are the ideal resource for children to practise decoding for reading and segmenting for spelling. Suitable for two or more children during small group work; as a fun opportunity to apply their phonics knowledge and grow vocabulary! 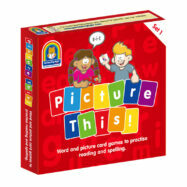 ‘Picture This!’ and ‘Picture Card Dictation’ – grow children’s vocabulary! Watch teacher, Alison Clarke, play Memory with Picture This.